The historical center of Dresden is located on the left bank of the Elbe, at the peak of a graceful river bend. Protected for centuries by mighty fortifications, the Saxon capital developed splendor and activity. Even today the buildings from the renaissance, baroque and 19th century architecture determine the Elbe front and the face of the city. In spite of vast destruction during the Second World War, the Old City part of Dresden has preserved or regained it’s fascinating historical buildings. The most famous symbol of reconstruction in the city center is the Dresden Frauenkirche , "the Church of our Lady". Its magnificent baroque dome dominates the city center. Many important cultural institutions are situated along the Old City side of the Elbe banks, from the Old Masters Picture Gallery to the "Green Vault", the treasure chamber of the Saxon electors and kings. The Old City is likewise the center of city life today where the Altmarkt square and Prager Strasse shopping centers, restaurants, culture and work are to be found. We leave early in the morning and take you north of Prague, to Germany, (bring your passport) approximately a 2 hour scenic drive through the mountains. The distance is only about 175 km/110 miles. On arrival there we take you directly to the old city for an orientation stop and walk with your guide. See the Church of our Lady, the Semper Opera, the gilded Statue of Augustus the Strong, the Procession of the Princes and more. There is so much to see in Dresden that one day is certainly not enough, however, after the orientation walk, unless you tell us otherwise, your guide will plan on taking you to the carefully chosen highlights - the Green Vault and the Old Masters Gallery - description is below. 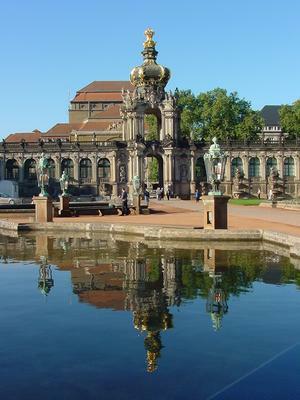 For more detailed information on Dresden, please go to the official Dresden City Guide. The Green Vault - the Old and New wing. This is a collection of art objects of all kinds. Statues, jewelry, tapestries, clocks, minitures ... an awesome collection of anything small enough to put in a museum. Most has been collected by former Saxon kings and hidden during WWII. The collection is divided into the Old Green Vault (a reservation is needed and we will be happy to make it for you) and the New Wing - no reservations necessary. 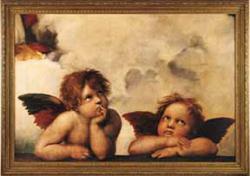 This is where the original Raffaels famous painting "The Sistine Madonna", with the leaning angels is located. Needless to say, the museum is full of incredible paintings by the most known masters such as Rubens, Raffael, Davinci, etc. Lunch is on your own but ample suggestions will be made. Your other places of interest may include the Albertinum, built 1884-87 which houses the Picture Gallery "New Masters", the Numismatic Collection, the Sculpture Collection, and special exhibitions. You can also take in the other historical sights of the city such as the Semper Opera, walk, shop or just enjoy the scenery. Or, for those interested, we continue a few kilometers to Meissen, (only possible if you are using a car or van) a town nearby, which is proud to be the home of the famous Meissen porcelain. 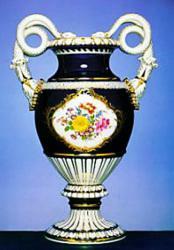 This is the place which in 1707/8 started to manufacture porcelain, first in Europe. Up to then it was available only from China - hence the "English" expression for porcelain dishes, "china". In Meissen, about a 45 minute drive outside of Dresden, you can visit the factory where the secrets of this art are revealed and samples can be purchased. We return back to Prague in the evening.
! Please note, most museums in Dresden are closed on Monday and some on Tuesdays. Therefore, it would be best to avoid these days.! A reservation and prepayment of the tickets for the Old Green Vault is necessary. We will be happy to make it for you.